So, full disclosure; this one took a while. I bought the book because 20% for the “Musings on Leadership” & 80% for the title and cover. I’m a guy. We’re pretty simple. When I cracked it open I was looking for… well… a book. I was looking for 1. an explanation of the title and then 2. a well weaved, progressive, story or lessons on how to increase my leadership and influence those around me to do the same. But that’s not what I got. 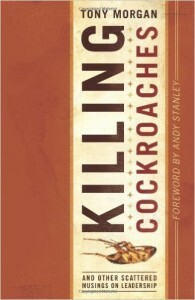 Instead, Killing Cockroaches, offers 220 pages of completely separate and unrelated entries that may or may not have to do with leadership or musing. Without subject based chapters or themes the book can be difficult to follow until you acknowledge it’s blog origins. The author is a successful blogger with over 7,000 subscribers and enough content to fill a book, which he did. My 3 Word Review was Semi-Helpful Repackaged Blogpost. 50 pages in I didn’t know where we were going or what the “big idea” was until I realized – there isn’t one. This is a book written by a blogger. Brain reset in 3, 2, 1…. “Oh, that was a good entry.” Once you stop looking for the Andy Stanley style chapters, the pages truly do avail themselves to be individual nuggets of wisdom, insight and actual leadership musings. From gentle jabs at church marketing to tipping of sacred cows; Tony gives out a little something for everyone. With clear expectations this can be a good read for a busy reader.